Please call to verify compatibility. Trojan’s proprietary Maxguard® Advanced Design Separator and exclusive Alpha Plus® Paste Formulation deliver longer life and enhanced performance. Do you have questions about our Trojan batteries, or questions about solar in general? Give us a call at 1-800-472-1142. We recommend Trojan Deep Cycle batteries for solar power applications even in the harshest of environments. These are appropriate for small wind and hydro-power applications as well as any solar PV application. Providing clean, reliable, uninterrupted power for RVs, boats, electric cars or floor machines, Trojan Deep Cycle batteries are an excellent choice. 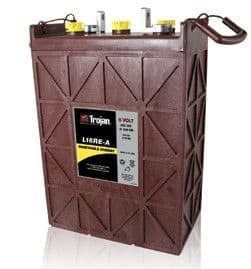 With over 85 years of experience, it's no wonder the Trojan Battery Company is the world's leading manufacturer of advanced deep cycle battery technology. Alpha Plus® Paste Formulation offers improved durability of the positive plate during use, thereby increasing cycle life. Greater current flow (lower resistance) increases the batteries' usable capacity (run time). Trapping of spent particles of active material prevents shedding and increases battery life.